What Are the Types of Angina? What Are the Risk Factors Angina and Atherosclerosis? Which Specialties of Doctors Treat Angina? Can I Care for My Angina at Home? What Is the Medical Treatment for Angina? What About Surgery for Angina? Do I Need to Follow-up With My Doctor After Being Diagnosed With Angina? What Is the Outlook for a Person With Angina? What Support Groups or Counseling Are Available for Someone With Angina and Their Family? Angina or angina pectoris, is the medical term used to describe the temporary chest discomfort that occurs when the heart is not getting enough blood. When the heart does not get enough blood, it can no longer function at its full capacity. When a person with angina eats, physically exerts themselves, or experiences strong emotions or extreme temperatures it increases the demand on the heart causing angina. Signs and symptoms of angina are temporary pain, pressure, fullness, or squeezing in the center of the chest or in the neck, shoulder, jaw, upper arm, or upper back. An episode of angina can be relieved by removing the stressor and/or taking sublingual (under the tongue) nitroglycerin. An episode of angina is not a heart attack; however, having angina does means you have an increased risk of having a heart attack. Angina can be a helpful warning sign if it makes a person seek timely medical help and avoid a heart attack. Time is very important in angina. The more time the heart is deprived of adequate blood flow (ischemia), and thus oxygen, the more the heart muscle is at risk of heart attack or heart rhythm abnormalities. The longer the person experiences chest pain from angina, the more the heart muscle is at risk of dying or malfunctioning. If chest pain is severe and/or recurrent, the person should see a health-care professional. sore muscles and ligaments in the chest (chest wall pain). It may also feel like tightness, burning, or a heavy weight. The pain may spread to the shoulders, neck, or arms. It may be located in the upper abdomen, back, or jaw. The pain may be of any intensity from mild to severe. These symptoms are identical to the signs of an impending heart attack described by the American Heart Association. It is not always easy to tell the difference between angina and a heart attack, except angina only lasts a few minutes and heart attack pain does not go away. If you have never had symptoms like this before, sit down. If you are able, call your healthcare provider, call 911, or go to the closest hospital emergency department. If you have had angina attacks before and this attack is similar to those, rest for a few minutes. Take your sublingual nitroglycerin. Your angina should be totally relieved in five minutes. If not, you may repeat the nitroglycerin dose and wait another five minutes. A third dose may be tried but if you still have no relief, call 911 or go to the nearest hospital emergency department. Stable angina is the most common angina, and the type most people mean when they refer to angina. People with stable angina usually have angina symptoms on a regular basis. The episodes occur in a pattern and are predictable. Stable angina symptoms usually last less than five minutes. They are usually relieved by rest or medication, such as nitroglycerin under the tongue. Unstable angina is less common. Angina symptoms are unpredictable and often occur at rest. This may indicate a worsening of stable angina, but sometimes the first time a person has angina it is already unstable. The symptoms are worse in unstable angina - the pains are more frequent, more severe, last longer, occur at rest, and are not relieved by nitroglycerin under the tongue. Unstable angina is not the same as a heart attack, but it warrants an immediate visit to the doctor or a hospital emergency department. The patient may need to be hospitalized to prevent a heart attack. The most common cause for the heart not getting enough blood is coronary heart disease, also called coronary artery disease. In this disease, the coronary arteries become blocked, narrowed, or otherwise damaged. They can no longer supply the heart with all of the blood it needs. Most cases of coronary heart disease are caused by atherosclerosis (hardening of the arteries). Atherosclerosis is a condition in which a fatty substance/cholesterol builds up inside the blood vessels. genetic predisposition may accelerate this build up. Another cause of unstable angina is coronary artery spasm. Spasm of the muscles surrounding the coronary arteries causes them to narrow or close off temporarily. This blocks the flow of blood to the heart muscle for a brief time, causing angina symptoms. This is called variant angina or Prinzmetal angina. This is not the same as atherosclerosis, although some people have both conditions. The symptoms often come on at rest (or during sleep) and without apparent cause. 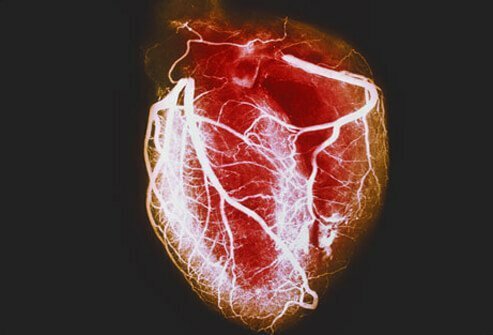 Cocaine use/abuse can cause significant spasm of the coronary arteries and lead to a heart attack. Risk factors for atherosclerosis and angina include the following. Some of these are reversible. Regular use of stimulants, especially nicotine, cocaine, or amphetamines: Other stimulants include theophyllines, inhaled beta-agonists, caffeine, diet pills, and decongestants. If the person has never had these symptoms, can call a health-care professional, especially if the person is uncertain of the symptoms or what action to should take. Do not delay calling 911. Do not wait for a call back from the doctor. Do not "wait it out." To wait is to risk your life. Emergency personnel are trained to recognize angina and to treat it rapidly and safely. If the person has had angina before, they may not need to seek medical care if the symptoms are the same as they always are. If the person has already been evaluated by a health-care professional and received advice about how to react to these symptoms, follow that advice. This usually involves rest, removing the stressor, and taking sublingual nitroglycerin. Any of these situations may be a medical emergency and requires a visit to a hospital emergency department. Don't delay or try to "wait it out." Do not drive yourself to the hospital. Call 911 for emergency medical transport. If a person believes they have risk factors for angina, but no symptoms, they should call a health-care professional to arrange for an evaluation in the office. Don't wait for symptoms to occur. Angina is sometimes treated in an emergency department by emergency medicine doctors. Individuals who sometimes experience angina may be treated by internists, family practice physicians, or cardiologists. In some cases, specialized cardiologists or cardiac surgeons are part of the treatment team. The patient's doctor or the Emergency Department doctor will immediately think of angina and other heart problems upon hearing the patient's symptoms. Time is of the essence, and treatment will probably begin as the evaluation continues. This painless test checks for abnormalities in the beating of the heart. Electrodes are attached to the chest and other points on the body. The electrodes read the electrical impulses linked to the beating of the heart. The ECG looks for signs of a heart attack or of impaired blood flow to the heart. For many patients with angina, the ECG result is normal. A chest X-ray: A chest X-ray will show any fluid buildup in the lungs. It can also rule out some other causes of chest pain. There is no blood lab test that can tell with certainty that someone is having angina. There are certain blood tests that suggest that a person may be having a heart attack. These tests may be done if a heart attack is suspected. If, after these tests, the doctor suspects the patient may have coronary heart disease, additional tests will be performed to confirm the possibility. Exercise stress test: An ECG is taken before, during, and after exercise (usually walking on a treadmill) to detect inadequate blood flow to the heart muscle indirectly by changes on the ECG. This usually is done only for stable angina. Thallium stress test: This is a more complex and expensive test that injects a radioisotope into the circulation and indirectly detects parts of the heart that may not be getting enough blood during "stress" (usually walking on a treadmill, or after administration of a drug that mimics exercise in those unable to walk on the treadmill). This information indicates more accurately whether any of the coronary arteries may be narrowed, causing inadequate blood flow to the heart muscle or ventricle. Again, this is usually done only for stable angina. Dobutamine echocardiogram stress test: This is done for people who cannot walk on a treadmill. A drug called dobutamine (Dobutrex) stimulates and speeds up the heart, creating an increased demand or need for blood flow tot he left ventricle or muscle. If the muscle shows a slowing of function on the ultrasound image of the heart muscle, then it indirectly indicates inadequate blood flow to the muscle. Coronary angiogram (or arteriogram): This test of the coronary arteries is the most accurate but also the most invasive. It is a type of X-ray. A thin, plastic tube called a catheter is threaded through an artery in the arm or groin to one of the main coronary arteries. A contrast, or harmless dye is injected into the arteries. The dye depicts the arteries directly and shows any blockage more accurately than the above or more noninvasive procedures. The doctor will make the decision about whether these tests or any treatment need to be done on an urgent basis. If so, the patient will be admitted to the hospital. If not, the tests will be scheduled for the next few days, and the patient may be allowed to go home. Stop doing whatever it is that causes the symptoms and call 911. Immediate help and intervention is the best chance for survival if someone is having a heart attack or other serious problem. Lie down in a comfortable position with the head up. Chew a regular adult aspirin or its equivalent (as long as the person is not allergic to aspirin). Chewing more than one will not do any good and may cause unwanted side effects. If the person has had angina before and been evaluated by a doctor, follow his or her recommendations. This may mean rest and the immediate use of sublingual nitroglycerin. It may include a visit to the hospital emergency department. Regardless of where the patient is sent, several basic treatments may be started. Which ones are given depends on the severity of the symptoms and the underlying disease. At least one IV line will be started. This line is used to give medication or fluids. Oxygen will be administered through a face mask or a tube in the nose. This will help if the patient is having trouble breathing or feeling uncomfortably short of breath. The direct administration of oxygen raises the oxygen content of the blood. Treatment will depend on the severity of the symptoms, severity of the underlying disease, and extent of damage to the heart muscle, if any. Simple rest and observation, an aspirin, breathing oxygen, and sublingual nitroglycerin may be all that the patient needs, if it is only angina. Medication may be administered to reduce anxiety. Medication may be administered to lower blood pressure or heart rate. Medication may be administered to reduce the risk of having a blood clot or to prevent further clotting. If the health-care professional believes the chest pain actually represents a heart attack, the patient may be given a fibrinolytic (a powerful clot-buster medication). After reviewing the patient's immediate test results, the hospital doctor will make a decision about where the patient should be for the next hours and days. If the diagnosis of angina is made, and the patient is feeling better and their condition is stable they may be allowed to go home. The patient may be given medications to take. Follow-up with a health-care professional within the next day or two will be recommended. The patient will be admitted to the hospital if they are unstable with continuing symptoms. Further testing will be ordered, and if the arteries are critically blocked, the patient may undergo coronary angiography, coronary artery angioplasty, or even coronary artery bypass surgery. Angioplasty is a treatment used for people whose angina does not get better with medication and/or who are at high risk of having a heart attack. Before angioplasty can be done, the area(s) of coronary artery narrowing is located with coronary arteriography. A thin plastic tube called a catheter is inserted into an artery in the arm or groin with local sedation. The catheter has a tiny balloon attached to the end. The catheter is threaded through the arteries and into the artery where the narrowing is. The balloon on the catheter is inflated, opening up the narrowing. Following balloon treatment, many patients require placement of a "stent," a small metal sleeve that is placed in the narrowed artery. The stent holds the artery open. If the patient has had angina symptoms and is visiting a health-care professional for evaluation, he or she will make a decision about how to proceed with the evaluation. The choices include going ahead with the evaluation on an outpatient basis, referring the patient to a specialist in heart disorders (cardiologist), or admitting the patient to the hospital for further workup. Nitroglycerin is a sublingual (under the tongue) medication relieves angina symptoms by expanding blood vessels and decreasing the muscle's need for oxygen. This allows more blood to flow through the coronary arteries. Nitroglycerin is taken only when the person actually has symptoms or expects to have them. Slow - or long-acting nitroglycerin can be used as a preventative treatment for angina but not until beta blockers are tried first. Beta blockers: Beta blockers lessen the heart's workload. They slow the heart rate, decrease blood pressure, and lessen the force of contraction of the heart muscle. This decreases the heart's need for oxygen and thus decreases angina symptoms. Beta blockers are taken every day, regardless of whether the person is having symptoms, because they are proven to prevent heart attacks and sudden death. Calcium channel blockers (CCBs): Calcium channel blockers are used primarily when beta blockers cannot be used and/or the person is still having angina with beta blockers. Calcium channel blockers also lower blood pressure and certain ones slow heart rate. Calcium channel blockers have to be taken every day. Aspirin: Daily aspirin therapy is mandatory to decrease the possibility of sticky platelets in the blood starting a blood clot. Statins: Statins lower cholesterol and have been shown to stabilize the fatty plaque on the inner lining of the coronary artery, even when the blood cholesterol is normal or minimally increased. Low density lipoprotein (LDL) or "bad cholesterol" levels should be less than 70 mg/dL for those at high risk of heart disease. Every person with angina needs to know exactly what his or her blood lipids/fats are. Miscellaneous anti-angina drugs: New drugs are being studied to treat angina. In 2006, the FDA approved ranolazine (Ranexa). Because of its side effects (potential to cause abnormal heart rhythm), ranolazine is indicated only after other conventional drug treatments are found to be ineffective. Like angioplasty, surgery is an option for people whose angina does not improve with medications and others who are at high risk of having a heart attack. Surgery is usually reserved for people with very severe narrowing or blockage in several coronary arteries. In almost all cases, the operation used for severely narrowed coronary arteries is coronary artery bypass grafting. The narrowed part of the artery is bypassed by a piece of vein removed from the leg, or with a piece of artery behind the sternum (internal mammary artery), or a portion of the radial artery taken from the lower arm or forearm. Several arteries can be bypassed in one operation. This is a very safe operation, with a mortality rate of less than 1%, in people whose heart muscle is not severely damaged irreversibly and who have normal lungs, kidneys, liver, and other organs. Because the chest is opened, the recovery time can be quite long, especially if the person is older and has multiple other health problems. If a person has stable angina, they will need to visit their health-care professional on a regular basis to monitor angina episodes and assess if risk factors are being reduced. Repeat cardiac catheterization to see if the dilated artery or stent is still open and/or a surgical bypass graft is still open or closed. This is the key downside of both angioplasty and surgery: arteries, stents, and grafts restenose (occlude) with the same disease process of atherosclerosis. None of these procedures are a permanent cure. The person has to be very compulsive in correcting potential risk factors, or they will return with the same blockages they started with. The best action is to reduce risk factors early in life. The goal is to not have angina, a heart attack, or sudden death in the first place. Although no one can escape aging, inherited risk, or gender, certain risk factors are in your control. Stop smoking and using nicotine in any form. Lower blood fats (through diet, exercise, and medications). Do not use stimulants such as cocaine or amphetamines. If a person already has atherosclerosis and angina, they can learn to take precautions to avoid having symptoms. Avoiding the "triggers" will help keep the person comfortable and free of symptoms. Avoid large and heavy meals that leave you feeling "stuffed"
The question of exercise for a person with angina is important. Exercise is recommended. If the person has been exercising strenuously, they may need to cut back to avoid symptoms. If the person has not been exercising, or has been exercising moderately, talk to a health-care professional first about physical activity that will be safe and comfortable. Sometimes a structured cardiac rehabilitation program is a beneficial way to begin an exercise program. The doctor may recommend taking an aspirin daily. Aspirin has been shown to reduce the risk of a second heart attack in people who have already had one, and may reduce the risk of a first heart attack. Taking aspirin is not without risks, especially in elderly people, people with digestive diseases or blood clotting disorders, and people who take certain types of medications. Allergy to aspirin is not uncommon. Tell your health-care professional if you are allergic to aspirin or have a reaction to aspirin. The most common and serious complications of coronary heart disease are heart attack and sudden death from cardiac arrest. A person's future depends on the severity of their condition, any heart muscle injury they have incurred, and their risk of heart rhythm abnormalities. The outlook is good if there is no prior heart muscle injury and angina is relieved by rest. Reversing risk factors will increase the long-term chances of avoiding a heart attack. Many authorities believe that some people can actually reverse plaque buildup through diet and exercise and reversing other risk factors for heart disease. The two large group of causes of chest pain are cardiac-related problems and non-cardiac related problems. Cardiac-related chest pain is most commonly referred to as angina. Podrid, P.J., MD. "Angina pectoris: Chest pain caused by myocardial ischemia." UpToDate. Updated Sep 23, 2015. How was the exams of your angina established? What are your angina symptoms? What was the treatment for your angina pectoris?